Makeup artistry is a highly competitive industry in which success is derived fron the quality of the training and your dedication to achieve the highest standard possible. Adverstising, television, cinema, events promotion etc are activities where the look, appearance and grooming of individuals is very important.the media makeup industry contributes professsionally to these requirements through hair styling,makeup,cosmetics and skin care. Our specialization is working exclusively for the â? ?bridal themeâ??. We believe in putting 100% effort and in making the â? ?to be brideâ?? a very special day of her life. She takes utmost care in giving you a look that is remembered forever. Yes! Without neglecting the most significant part of your wedding, â?? the photographyâ?? which is going to be your lifetime memory, we promise you the best composition to go along with your beautiful dress as well as jewellery. Studio7 Makeup Academy aims in imparting knowledge to aspiring esthetical as well as those who are already in this field. Studio7 main objective is to bring in International level of education, quality education in state of the art academy. The lessons at STUDIO7 are delivered in a relaxed yet professional atmosphere and our modern teaching methods are designed to keep up with the rapidly expanding beauty profession. "Especial thanks to you shereen mam, I came to you from Vijayawada and I have learnt a lot from you and now working for a reputed brand in Hyderabad now. Thanks a lot for your support from the day one till now. I highly recommend studio 7 to all those who are willing to make their career in makeup industry. " "The Best Place To Learn Makeup. It's not just an Academy where one learns Makeup, becomes pro very Hospitable Place. Would definitely recommend Thanks Shereen Mam. " 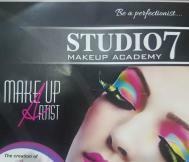 Studio7 Makeup Academy conducts classes in Makeup. It is located in Banjara Hills, Hyderabad. It takes Regular Classes- at the Institute. It has got 2 reviews till now with 100% positive feedback.